Recombinant human Macrophage Inflammatory Protein 3 alpha (ab9830) can be used as a positive control in WB. Our Abpromise guarantee covers the use of ab9829 in the following tested applications. 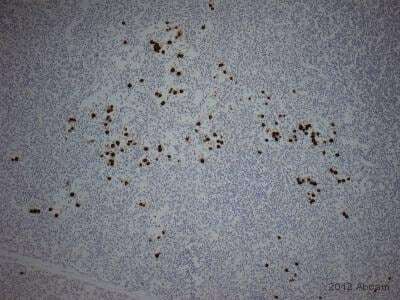 IHC-P Use a concentration of 15 µg/ml. WB Use at an assay dependent concentration. To detect hMIP-3-alpha by Western Blot analysis this antibody can be used at a concentration of 0.1 - 0.2 µg/ml. Used in conjunction with compatible secondary reagents the detection limit for recombinant hMIP-3-alpha is 1.5 - 3.0 ng/lane, under either reducing or non-reducing conditions. ELISA Use at an assay dependent concentration. To detect hMIP-3-alpha by direct ELISA (using 100µl/well antibody solution) a concentration of at least 0.5µg/ml of this antibody is required. This antigen affinity purified antibody, in conjunction with compatible secondary reagents, allows the detection of 0.2 - 0.4 ng/well of recombinant hMIP-3-alpha. Neutralising Use at an assay dependent concentration. To yield one-half maximal inhibition [ND50] of the biological activity of hMIP-3-alpha (100 ng/ml), a concentration of 15.0 - 18.0 µg/ml of this antibody is required. Chemotactic factor that attracts lymphocytes and, slightly, neutrophils, but not monocytes. Inhibits proliferation of myeloid progenitors in colony formation assays. May be involved in formation and function of the mucosal lymphoid tissues by attracting lymphocytes and dendritic cells towards epithelial cells. C-terminal processed forms have been shown to be equally chemotactically active for leukocytes. Possesses antibacterial activity E.coli ATCC 25922 and S.aureus ATCC 29213. C-terminal processed forms which lack 1, 3 or 6 amino acids are produced by proteolytic cleavage after secretion from peripheral blood monocytes. ab9829 (1µg/ml) staining Macrophage Inflammatory Protein 3 alpha in human tonsil (left panel) using an automated system (DAKO Autostainer Plus). Using this protocol there is strong staining of vesicles. Immunohistochemical analysis of pancreatic ductal adenocarcinoma tissue, staining Macrophage Inflammatory Protein 3 alpha with ab9829. Antigen retrieval was performed by heat mediation in citrate buffer (pH 6.0). Tissue was blocked with 1% BSA for 10 min. The samples incubated overnight with primary antibody (1/40). Staining was detected using DAB. Sections were counterstained with hematoxylin. Publishing research using ab9829? Please let us know so that we can cite the reference in this datasheet. We ordered an anti-Macrophage Inflammatory Protein 3 alpha antibody (ab9829) from your company recently. It just mentioned that this antibody is immunogen affinity in the data sheet. But the information of isotype and light chain type shows unkonow. Therefore, I am not sure if this antibody is from serum or purified. Because I want to set a negative control as the same concentration with this antibody when I do experiment. So I want to know the exact IgG concentration of this antibody. para el chequeo del anticuerpo. Para testar este anticuerpo en Western Blot usamos la proteína recombinante MIP-3 alfa diluida. Respecto al protocolo usado, se usó una concentración de anticuerpo de 0.1-0.2 ug/ml, y condiciones reductoras de la muestra. El resto de condiciones del protocolo son las estándares de un ensayo de Western Blot. Puedes encontrar más información sobre este protocolo en https://www.abcam.com/index.html?pageconfig=resource&rid=11375. Te recuerdo que todos nuestros productos tienen un año de garantía. En caso de no funcionar tal y como se especifica en su datasheet se reemplazará el producto o reembolsará el importe del mismo. Espero que esta información sea de utilidad. No dudes contactarnos de nuevo para cualquier otra duda. 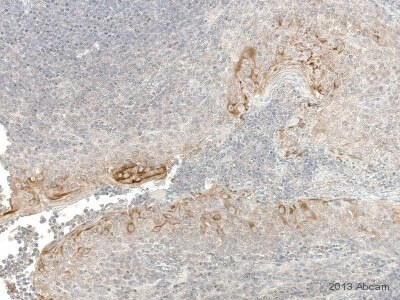 What is a good tissue section to use for IHC-P as a positive control in mice? Are there any tissues that constitutively express Macrophage Inflammatory Protein 3 alpha (MIP3-alpha/CCL20) in normal mice? According to the Unitprot entry for this proteinhttp://www.uniprot.org/uniprot/O89093, CCL20 is prominently expressed in the small intestine, colon and appendix. It is also found in thymus, spleen, lymph node and lung. We would recommend using the same tissue type as referenced in the above publication for control as data is available however you should be able to see CCL20 in any of the tissue types listed in the Uniprot entry. I would like to test ab9829 in FFPE Rat tissue. Thanks! I am very pleased to hear you would like to accept our offer and test ab9829 inrat tissue. This code will give you: 1 free PRIMARY ANTIBODY before the expiration date. To redeem this offer, please submit an Abreview forrat tissueand include this code in the “Additional Comments” section so we know the Abreview is for this promotion. Please remember that submission of the Abreview is sufficient for the discount code to become active. Pouvez-vous me confirmer la réception de mon précédent email. email bien reçu. J'ai mis en place l'envoi de l'anticorps de remplacement et je vous ai communiqué le numéro de cette commande gratuite. Avez-vous bien reçu cette confirmation de votre coté? Votre proposition de commande pour l'anticorps référencéhttps://www.abcam.com/ab85032en remplacement de l'anticorps défectueux, comme convenu lors de notre entretien téléphonique, me semble parfaite. Comme convenu j'ai mis en place l'envoi d'une unité gratuitede ab85032 en remplacement du ab9829 qui n'a pas fonctionné comme attendu en IHC-P. Le numéro de commande de remplacement gratuit de ce produit est *****. Vous recevrez prochainement un mail de confirmation comprenant les détails d'expédition. Thanks for your kindly reply, after contacting with this customer and passed these suggestions to him then he modified the experiment step as your suggestions, but it did not improve the result. And he also indicated the secondary antibody was work well with other primary antibody. I also attached the result in this letter, please check it and help this customer to solve these problems. Thank you very much for checking with the customer. I am very sorry to hear that the suggestions did not help to improve the results. I must conclude that the antibody vial has been faulty. I am very sorry for this inconvenience and would like to offer the customer either a credit note or a replacement antibody. Please let me know if the customer would like to accept this. Please let me know also if he has any additional questions or concerns.